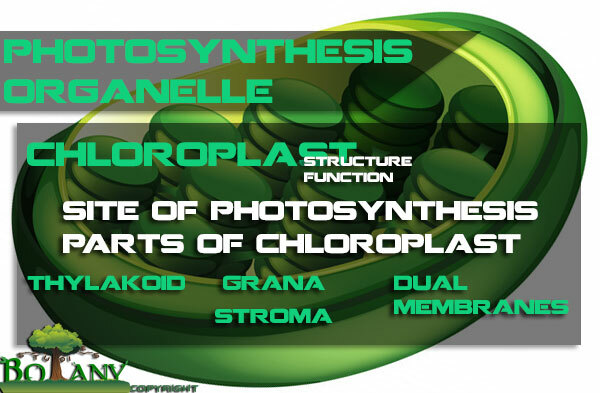 Photsynthesis organelle is also referred by another name known as chloroplast. Chloroplasts are defined as the sub cellular organelle (Plastid) in green plants in which chlorophyll is present and process of photosynthesis takes place. The chloroplasts vary in shape, size from species to species. but typically, they are 1 – 2 μm (1 μm = 0.001 mm) thick and 5 – 7 μm in diameter. These arise from tiny immature, small, nearly colorless bodies called protoplastids found in the unfertilized egg cells. These are with few or no internal membranes. They develop into chloroplasts when the leaves and stems are formed. Chloroplast Location: The photosynthesis organelle in plants is located through out the cytoplasm. At the end, it depends on the type of plant they are present in. Simply, the chloroplasts are responsible for green color of plants dues to the presence of green pigment (chlorophyll – A green pigment present in the leaves of plants). Where ever you see green color on plant you can easily identify that chloroplast is their. 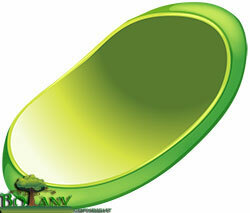 Shape of Chloroplast: The chloroplast is an oval shaped plant cell organelle. They can also distinguished as round, disk shaped plant cell organelles. The photosynthesis organelle is differentiated from other plant cell organelles due to the green pigment chlorophyll. Two types of pigment are present in chloroplasts. The first one is chlorophyll a and the other one is chlorophyll b. Here the chloroplast is divided into sections one will give detail view of structure of chloroplast while the other portion will describe how photosynthesis organelle helps in process of photosynthesis. Each chloroplast is surrounded by a double unit membrane that controls the movement of molecules into and out of chloroplast. 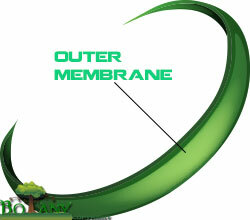 Each membrane consists of a lipid bilayer and proteins. The most striking aspect of the structure of the chloroplast is the extensive system of internal membranes known as thylakoids that contain photosynthetic pigments. Each thylakoid (Gr. Thylakos = sac or pouch) is like an external surface of a flattened tube or sac. Most of thylakoids appear to be very closely associated with each other. These are stacked to form grana (sing. granum). 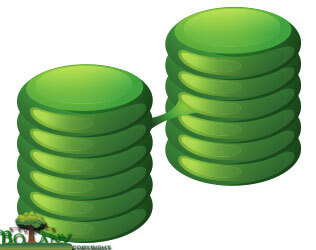 The closely packed thylakoids forming granum are known as grana thylakoid or lamellae. 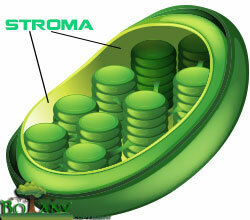 The region of chloroplast outside the thylakoid is called stroma. 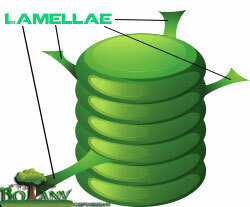 The thylakoids of one granum are connected to the thylakoids of the adjacent granum through longer thylakoids called stroma thylakoids or lamellae. A cavity called channel is present between the two membranes of each thylakoid. This channel is filled with water and dissolved salts. It plays a special role in photosynthesis. The photosynthesis organelle converts the radiant energy of sun into sugars in plants. In the chloroplasts the light energy is harvested by two different functional units called photosystems. The absorbed light energy is used to power the transfer of electron between a series of compounds that act as electron donors and electron acceptors. The final electron acceptor is NADP+ which is reduced to NADPH. Light energy is also used to generate proton motive force across the thylakoid membrane, and the resultant proton gradient is used to synthesize ATP. The light reactions (oxidation of water or photo-oxidation) of photosynthesis take place in grana thylakoids which contain, chlorophyll in their membrane system whereas the (Calvin cycle) dark reactions (carbon fixation) occur in stroma. The chloroplast is involved in both stages of photosynthesis. The light reactions take place in the thylakoid. There, water (H2O) is oxidized and oxygen (O2) is released. The electrons that freed from the water are transferred to ATP and NADPH. The dark reactions then occur outside the thylakoid. 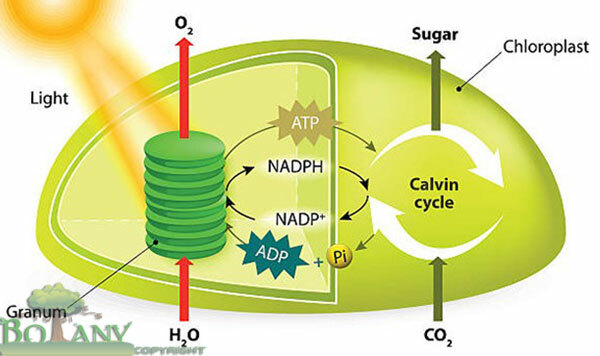 In these reactions, the energy from ATP and NADPH is used to fix carbon dioxide (CO2). The product of this reaction are sugar molecules and various other organic molecules necessary for cell function and metabolism. Note that the dark reaction takes place in the stroma (the aqueous fluid surrounding the stacks of thylakoids) and in the cytoplasm.